Note: Readers may copy and share pages from this publication if a reference to PowerandReality.com is visible. This journal is based on PowerAndReality.com, which is a new phase of my efforts at expressing my thoughts, which began with WhatIsTrue.com and CanadianLiberty.com. I don’t want to cause offence just for the sake of it, but I suspect that most readers are at some point going to find the content challenging for different reasons. I expect the website and journal content to become more interesting. I want to continue the themes I have already begun (Brave New World, vaccines, carbon tax, petitions), but there is also a lot of diverse information to share with readers. Even though I build on the work of other researchers, hopefully you notice some original ideas occasionally, as everyone has their own individual ways of thinking and life experiences. I think it’s likely that I will be sharing some information that has never been published on the Internet before, and I hope to make new connections and discoveries–at least as far as the Internet and alternative media is concerned. As far as doing something about the awful reality we are facing–to put a stop to H. G. Wells’ “Open Conspiracy” of “social reconstruction”–I have started to take a fresh look at the topic of active strategies (in addition to the sort of political activity I was involved with in the past). I want to take a look at what others have already come up with and see what can be applied in the real world effectively—beyond social media and into official channels. What can be done using words and information–when words and information are directed off-line through independent politicians, the legal system, affidavits to police and prosecutors, product boycotts, petitions to legislatures, petitions to corporations, school boards, and officials of all kinds? A major reason for creating this publication: As there are growing efforts to censor the Internet–the noise about “fake news” being a sign of this–I think that we should prepare to direct a lot more attention to off-line communication so that data can be shared in different ways, in print or otherwise. I have other ideas about this (nothing original as far as I know). The problem with the Internet isn’t just the efforts at censorship, and it isn’t just about how it is used as a surveillance tool. I also think that the Internet leads us away from making beneficial connections with others, connections which are necessary for building something real. All of this might seem too ambitious, but I think that’s how it has to be. I feel like making a break with most of the alternative media trends. After a while, being mesmerized with alternative media becomes very similar to being mesmerized by TV. One of the realizations I’ve had recently after considering the wrecking ball that is demolishing the lives of many people we know personally–as far as health and relationships and everything else–is that it’s not enough to think that we can actually have any kind of tolerable future at all if we just have a passive approach to the New World Order machine imposing its toxic policies. Even though its agenda has been in the planning for a long time and most people are in differing degrees blind to what is happening, I really don’t think we can just stand by as paralyzed and mesmerized on-lookers. Myself, for sure, I am not going to get caught up in the manipulations of some false opposition either, letting some bozos herd me around in useless directions with ridiculous fantasies. Don’t hand over your responsibility for your thinking and decisions to those who are going to lead you around in circles. I am hoping that those who are like-minded and able to build connections can work together in some ways while at the same time exercising independent thought. The Carbon Tax, having been pushed by international agreements and by the Government of Canada, has been implemented by provincial governments such as Alberta and Ontario . 1) It will create hardship. It will make life harder for everyone, especially for the less fortunate—whoever is not covered by rebates. Logically it will increase prices on everything that requires fuel, which also means everything that requires transportation. An example of this would be to cause greater hardship for seniors especially–or others on fixed incomes–who are trying to heat their homes. If they have to pay more for fuel, they will turn down the thermostat when they would otherwise have left it alone. Most of us already do that of course, but it looks like we will be doing that more often under a carbon tax! And probably more seniors (and others) will be wearing their coats inside and riding transit or spending time in malls to keep warm so that they don’t freeze to death like many already do . Possibly they–or we–will have to move somewhere cheaper and more controlled and give up our homes (Smart Growth) . In effect, someone has decided that we are not allowed to spend our income—most peoples’ income being limited to some degree–on keeping our homes at a desired temperature. Many people don’t see the climate change doctrine and carbon tax for what it is. I am trying to describe what it is really about and what the consequences are. For many, their minds and thoughts are locked in a prison built on years of propaganda and conditioning from education and media. They are prevented by their induced beliefs from seeing what “climate change” is really about. It’s about a loss of freedom, it’s wealth redistribution (and it’s not going to the poor), it’s “earth first” before humans (but really it’s elites preserving the earth for themselves), it’s a power grab. The “evidence” of man-made greenhouse gases causing climate change is full of holes. Many of us become the victims of various kinds of deception, fraud and abuse. This is the same thing on a larger scale. However, I have read Agenda 21. I have read H. G. Wells’ “Open Conspiracy” and many other books we should discuss. I know what the word “development” refers to when it’s in the UN and World Bank documents. I know they constantly refer to population. It’s a fact that certain countries get hit by mandatory sterilization blitzes and mandatory one-child policies. It’s also a fact that we have been subject to decades of media propaganda about population . Someone has decided—not explicitly, but in effect, for all practical purposes–that most of us will not be able to set aside more money to help our family members with their special nutritional needs and their health needs and their heating needs. In other words, some authority has decided–in order to “save the earth” they say–that we are spending “too much” on food, and we’re spending too much on everything that costs money to transport–clothes, and vitamins and prescriptions and special equipment for health care, and elder care, and child care, and we’re spending too much on transportation and travel, and we’re spending too much on everything we need, think we need, and want. They say that the earth’s climate is “changing” (as it always has ) so we need to pay money to the government so that it can supposedly “mitigate” that “climate change”. Again, in effect, we are being told that we don’t really need all of that stuff we buy after all. We don’t need so much heat, we don’t need so much fuel, we don’t need so much food, we don’t need all the luxuries–books, games, toys, sports equipment, restaurant trips, movies, ice cream, candy, alcohol, cigarettes, entertainment–things that our current budgets might allow for. What about long drives in the country or visits to relatives? What about air travel? People over a certain income level will still be able to do certain things, but what about the majority? Maybe we didn’t need those things already, but now we really won’t need them, right? Because of some lame story that’s full of holes. Remember, these are the same “caring” elites who bomb other countries to smithereens. If you haven’t noticed, governments and corporations turn reality upside down in an endless number of ways now–showering the planet in pure bull day after day. Life is too easy for us supposedly, and we can stand having it a bit tougher, right? We have all sorts of extra money supposedly, so we don’t need to raise our children and pay for their needs and their futures. The implied message of the carbon tax (the “green” religion) is that our lives are too rosy to maintain because we’re “destroying the earth,” as their “science” claims, so therefore it won’t hurt us to make our lives less rosy by paying more money to those in power. Who needs restaurants? Who needs those businesses, right? There’s no shortage of health care? There’s no homelessness? Nobody has a problem with paying food prices? Who needs all those trucks on the road transporting goods? There’s no employment problem, right? There’s no poverty problem, right? There’s just a “climate problem.” We’re not sending enough of our money away to the government to help create a global bureaucracy of “scientific” managers to keep the planet’s temperature within a certain range . So, that means less for everything! Less for everyone. Less is more. That’s going to “save” us! Everyone being poor–except the elites and their bureaucracies–that’s going to save the earth! A lot of thought has gone into this “climate change” carbon tax project–a certain kind of thought. 2) It is totalitarian. The carbon tax is totalitarian in nature (as with other policies), because it will lead, in effect, to government control and rationing of the supply of everything, and very likely to targeting certain kinds of goods selectively for potential rebates, which, in that case, would lead to a justification for all information being collected on everything we buy, including all energy consumption and food consumption. In other words, your life needs to be managed. Think of all those things that aren’t “good for you” (according to experts who lovingly want to manage you) and those things that you “don’t need” and things you’re not feeling “guilty” enough about yet. They’re standing by ready to “nudge” you in the “right” direction . The first climate change treaty was signed in 1992, and it came in alongside the communitarian United Nations Agenda 21 project, which is a global plan for the inventory and surveillance of all resources on earth . The carbon tax is also a step towards the “Technocracy” plan from the first half of the 20th century which sought to keep track of all energy use . Thanks to WI-fi, smart meters, smart grids and smart cities, everything and everyone can potentially be monitored. You can even monitor yourself and share that information with the world. Isn’t that fantastic? You’re helping to save the world. All sorts of things can be shared–your information and your money. And they have already massaged potential disagreement out of many (in the younger generations especially) using public and private media and education. Yes, governments and large corporations work together to run things, to “save” us by making our lives more controlled. We’ll have a “better” world through a lower standard of living and more monitoring of our behavior and thoughts. Sure. 3) Carbon tax is based on an invalid theory with clear origins in social engineering and the monopolist desire to control resources. By the way, carbon dioxide should not be considered a pollutant. It is not smog. It is a product of combustion–just like water vapor, which is also a greenhouse gas, but it would sound absurd to demonize water, right? Carbon dioxide is a clean, odorless, life-giving gas that we breathe out and which plants require for life. The more carbon dioxide, the more plants, the more life. Also, the natural world (not counting us) emits more carbon dioxide than humans could ever emit if they tried–from oceans, decaying plants and animals, forest fires, volcanoes (land and sea)       . The origin of the man-made climate change premise is totally dubious. There has always been extreme weather. There have always been periods of much warmer weather and much colder weather . See for example, ironically, United Nations official Julian Huxley’s book, Man Stands Alone, which includes an essay on how the Sun appears to cause long cycles of climate change–beyond just seasonal change . Other websites criticize the details of the climate change dogma at length, so contrary information is available . Elsewhere I have quoted page 115 of the Club of Rome’s book, The First Global Revolution, which states very clearly that they needed an enemy to unite humanity under a global government. This think-tank decided that humanity would be portrayed as the enemy of itself, as the cause of such problems as “global warming.” They decided that such a justification would “fit the bill” . The three Canadian provinces that have introduced carbon taxes–B.C. earlier, Ontario and Alberta as of January 2017: http://www.macleans.ca/economy/economicanalysis/what-carbon-prices-in-alberta-and-ontario-will-cost-the-average-household-and-why/ – The cost of carbon pricing in Ontario and Alberta, January 4, 2017. Claims that carbon pricing will lead to skyrocketing price increases throughout the economy are misplaced at best—and misleading at worst. First of all, the charts certainly do show price increases. Second, did anyone claim there would be “skyrocketing” price increases? I don’t know or care if they did. The graphs don’t need to be pointing straight up like a rocket for people to be concerned about the consequences of carbon taxes. This is a “straw man” argument  . Climate change, and policies to cost-effectively lower emissions, is such a critical policy area that cooler heads will hopefully prevail. When you realize how flimsy this theory is someday, you should reconsider the implications of someone trying to “lower emissions” without a rational justification (such as reducing actual toxic substances such as hydrogen fluoride or sulphur dioxide or mercury) if your whole quality of life and survival depends on maintaining activities that create carbon emissions! Again, their charts show price increases. Also, in reality, governments can do whatever they want with their promised “rebates” if any, and they can crank up these taxes as slowly or as quickly as they like–or ultimately as determined by the instructions from an international body who organizes a carbon regime. This whole thing is based on international agreements created by private and unelected organizations, and not on the needs and desires of ordinary people. Who’s to say how the rebates are going to affect us or how high the taxes are going to go? We don’t know. It’s not in our hands. It’s too “important” for us. And I bet these provincial governments don’t know either. Evidence of this vulnerability to seniors is clear with the high UK death-rates due to winter cold. (For Canada and other countries, see below). http://www.dailystar.co.uk/news/latest-news/301641/1M-Brits-dead-in-winter-scandal – “WINTER weather has killed a million Brits since the 1980s and will kill a million more by 2050, experts have warned,” March 3, 2013. Pensioner organisations warned the current colder-than-average winter will kill more than 26,000 people by the end of March – as Britain’s winter death toll reaches a million in just 30 years. Despite this serious problem, the U.K., along with European nations, have implemented a carbon tax. The U.K. — England, Scotland, Wales and Northern Ireland — has maintained a carbon tax since 2013. . .. the tax is a “carbon price floor” that functions as the minimum price that fossil fuel producers pay to emit CO2. Whenever the carbon price in the EU’s Emissions Trading System (ETS) is less than the U.K. minimum . . . the producers pay the difference . . . The carbon tax is intended to solve an alleged “problem” about climate. But the real problem seems to me that vulnerable human beings are dying from cold in winter. This is supposed to be a wonderful, modern, “caring” society where everyone is so “progressive”. “Caring” about what? Not about poor people at all. Think about who runs things and what their attitudes are? Who is speaking through these “liberals”, these “progressives”? The purpose of the climate change doctrine is to put human beings in their place! It’s a tool of power. Shouldn’t someone just lower the fuel prices somehow? But these people advocate raising it–via their tax!! And I have never advocated subsidies for anything, but wouldn’t that be better than people dying–especially if you were aware that people were dying–hiding information is part of the false reality we live in! In 2006, there were 5,640 excess deaths during the winter months in Canada. What happens when you start cranking up the cost of natural gas with a carbon tax? What happens when you imagine you are going to substitute other, supposedly plausible forms of energy that are more expensive and less effective? What do you think is going to happen? Life is going to be tougher, isn’t it! Let’s snap out of our delusions and live in reality. Obviously the carbon tax isn’t going to stop the winter deaths. The story of climate change is another strategy to reduce the status of our fellow human beings and their welfare even further. I believe the promotion of moral relativism allowed this and was another strategy along with degradation in entertainment and other methods. This can be called the will to power. Those with power want even more power and monopoly control over the rest of us–over our minds and everything else. Money is the tool that gets their plans accomplished, whether it’s money for warfare or marketing. The name of local Agenda 21 policies like this one varies. In Ontario, this long-term policy is also called “Places to Grow”: https://www.placestogrow.ca/index.php?lang=eng (accessed April 10, 2017). One of the contradictions you can find–if you give yourself permission to see it–is the fact that scientists have claimed (through the same media insisting that man’s industrial emissions have some significant effect on climate) that there have been very cold and very hot periods in the earth’s history–periods when there was no human activity at all, and later when there was no large-scale industrial activity at all. Between 600 and 800 million years ago–a period of time geologists call the Neoproterozoic–evidence suggests the Earth underwent an ice age so cold that ice sheets not only capped the polar latitudes, but may have extended all the way to sea level near the equator. The article states that there was a huge release of carbon dioxide into the atmosphere during this warm period. Whether or not this information is correct, this is what is believed in science. In the big picture, there are supposed to have been five major ice ages: https://en.wikipedia.org/wiki/Ice_age#Major_ice_ages. http://canadianliberty.com/?p=23243 – Policy themes of Brave New World – Control Over Science. http://canadafreepress.com/article/carbon-currency-a-new-beginning-for-technocracy “Global currency replacing all paper currencies, limiting manufacturing, food production and people movement” by Patrick Wood, January 26, 2010. A straw man is a common form of argument and is an informal fallacy based on giving the impression of refuting an opponent’s argument, while refuting an argument that was not advanced by that opponent. . . . The natural CO2 flux to and from oceans and land plants amounts to approximately 210 gigatons of carbon annually. Man currently causes about 8 gigatons of carbon to be injected into the atmosphere, about 4% of the natural annual flux. . . . This particular article (from a critical point of view) basically points out that just because the earth was supposedly in a warming phase (causing the ocean and other sources to release more carbon dioxide), this doesn’t mean that the warming was caused by man’s emission activity. Recovery from the Little Ice Age, driven by the sun, is causing the oceans to release CO2. It is temperature driving CO2 release, not the other way around. Also, by the way, in my view, more carbon dioxide isn’t a bad thing and the earth warming (whether it is or not) isn’t necessarily a bad thing. All of the emotional baggage loaded onto these concepts is just a propaganda method. Plants require carbon dioxide to grow and they emit oxygen . More plants, more oxygen, more good things for us. Because we care about humans, right? Plants take in carbon dioxide during photosynthesis and give out carbon dioxide during respiration [as animals and humans do also]. Dead plants and animals decay and carbon dioxide is released into the atmosphere to be used by plants again. carbon dioxide is then re-emitted into the atmosphere through volcanic eruptions. Volcanoes emit large amounts of carbon dioxide. Since totalitarianism tends to politicize subjects like this nowadays, at every possible opportunity (danger sign, more dangerous for us than “climate change”), the top articles I find coming up in a Google search will insist (weakly I think) that man-made carbon emissions are greater than known volcanic emissions. I don’t know if anyone has added up the numbers properly, taking into account undersea volcanoes also, but we know volcanoes emit a huge amount according to the official information. There have always been forest fires, even with natural causes–just like herds of bison, etc. have always emitted massive amounts of methane independently of humans domesticating animals (but the anti-meat, breakfast-of-slaves agenda wants you to think otherwise. You’ve heard that too, right?) Humans could do a better job of managing forests near towns to protect human interests if governments didn’t have incompatible priorities. Isn’t that something? Despite all the dogma inserted into most of these articles, the facts about what the oceans emit (never mind what forest fires, volcanoes, and decaying plants/animals emit) reduces the idea of man-made emissions causing climate change to complete irrelevance. OK, I just asked Google as simple question “component gases atmosphere,” and what happens? These tiny trace greenhouse gases are supposedly affecting the global “energy balance.” All of a sudden, this vague mystical phrase creeps in about “energy balance.” Do you mean that taxes suddenly appear on energy as a natural process? I guess not, but making those kinds of parallels would be good marketing for the carbon tax. Notice how tiny the percentages are for carbon dioxide and methane. What about water vapor? Is that a greenhouse gas? Yes. Why is it separate from consideration? It’s true that water vapor is the largest contributor to the Earth’s greenhouse effect. On average, it probably accounts for about 60% of the warming effect. . . . But then the article proceeds to make out how water vapor is a special case because it’s condensable, etc. And then things become very uncertain when they start talking about clouds. It’s worth reading, because you’ll get the idea of how this is all very shaky. The amount of water vapor is increased by warming, OK, but aren’t natural emissions of carbon dioxide supposed to increase with warming also (so that these tiny amounts increase)? We’ve confirmed that officially water vapor is a greenhouse gas that contributes to the warming process in the atmosphere, so is anyone going to demonize water vapor and tax us for that? Carbon dioxide and methane are trace gases, dwarfed by water vapor, but they’re all classified as greenhouse gases. The affect of water vapor and clouds on temperatures is poorly understood according to the article. We’re supposed to believe that there is some reasonable, non-contradictory way to blame human emissions of totally natural carbon gases–carbon dioxide and methane–for any kind of significant effect on climate. Science shows CO2 levels are an EFFECT NOT A CAUSE of natural changes in climate. Even if CO2 were a driver of climate and temperatures the idea that Man’s CO2–which contributes only 4% of the total flux of CO2 in and out of sea/land–controls the other 96% is deranged conspiracy-of-nature-theory for which there is no evidence. Termites produce 10x Man’s CO2 equivalent so if CO2 is a problem we should have a war on termites. Man Stands Alone by Julian S. Huxley, 1941, first edition. Harper & Brothers. (Note: same work published in England as The Uniqueness of Man, which is the title of the first chapter). Edition defective, some pages out of order. Also see Dr. Piers Corbyn’s website: http://www.weatheraction.com, who has been attacked for saying that the Sun and other astrophysical cycles cause changes in the earth’s climate. Related site: https://weatheraction.wordpress.com/. This includes information about the ClimateGate email scandal. 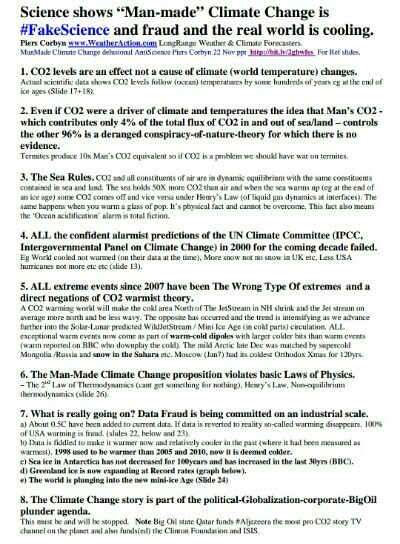 http://canadianliberty.com/?p=4468: A lot of references to information about climate change, including the websites of researchers who contest the climate change doctrine (see also notes  and  above). Alexander King and Bertrand Schneider, The First Global Revolution: A Report by the Council of The Club of Rome (page 115), 1991.